Here’s a guest post I thought you’d enjoy explaining how to perform some coin magic tricks. Imagine the fun you can create when you make a fellow collector’s coins magically disappear. But don’t worry, we’ll show you how to make them reappear before the police are called! Next time you’re at a numismatic get-together, try a few of these amazing coin tricks. You’re seated with a friend at dinner. After dessert you ask to borrow a coin, preferably an 1895 Morgan Silver Dollar Proof, but a quarter will do. Drop it inside your dinner napkin, flick your wrist and snap the napkin in the air. The coin vanishes! Ask your friend to look under your coffee cup. He’ll be amazed when he sees the coin has magically reappeared. Here’s how to do it. You’ll need a handkerchief or cloth napkin, a rubber band and an extra quarter (or an extra 1895 Morgan Silver Dollar Proof, if you happen to have one sitting around). 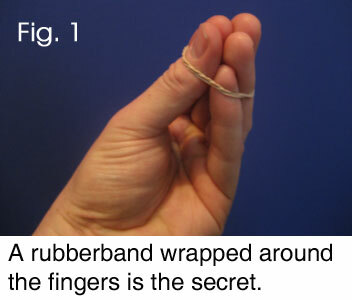 Before you officially start the trick, wrap a rubber band around the fingers and thumb of your left hand. The rubber band should be snug but loose enough to let you open your fingers a little. Drape the handkerchief over your upright left hand and borrow a coin. Now jam the coin in the handkerchief and into circle formed by the rubber band, creating a little trap for the coin. Slide the rubber band off your fingers so that the coin is trapped inside the handkerchief. Make some magical gestures, wiggle your fingers and arch your eyebrow as you whisk the handkerchief off your hand with the quarter trapped inside the rubber band pocket. It’s a starling vanish. Put the handkerchief out of sight before they notice the odd little bulge where the coin is hidden. Point to your coffee cup and ask your spectator to lift it, revealing the coin. How to make it reappear under your coffee cup? That’s where the duplicate coin comes in. You’re going to have to sneak it under the cup before you start the trick. The secret is to not make a move out of it. Don’t mention that you’re about to do a trick. Wait for your for an opportune moment, perhaps when your dining companion check his cell phone or is looking at the dessert menu. The rest is showmanship. This one is more of a practical joke than a magic trick, but it’s lots of fun nonetheless. Take a small coin like a penny or dime a put just a tiny a drop of water on it. Place the wet side of the coin against your forehead and wrinkle your brow, causing the coin to drop off your head and in to the palm of your hand. Your friend will be sure to ask you what you’re doing. Say, “It looks easy, but I bet you can’t do it.” When your friend agrees to the challenge, place the moistened coin against his head and press it on firmly. Hold the coin against his head for a moment and secretly take it away as you direct his attention to his palm up hand. He won’t notice it missing; in fact it will feel as if it is still there. Tell him, “You can’t touch the coin. You have to take it off by wiggling your eyebrows and catch it in your hand.” Your friend will stand there making the strangest faces as he tries in vain to dislodge a coin that isn’t where he thinks it is. It’s a funny trick to do when you’re out with a group. Borrow a coin from your friend, assuming you have any left after that last trick. Take the coin in your right hand bend the left arm and pretend to rub the coin into the elbow, but in doing so, appear to accidentally drop the coin to the floor. Pick it up with your left hand and pretend to place it in your right hand. Pretend you hold the coin in your right hand as you rub the imaginary coin into your elbow, all the while explaining how you’re attempting to charge the coin with static electricity. While focusing the viewer’s attention on your right hand, drop the coin into the collar of your shirt. Slowly take your right hand away from your elbow to reveal the coin is gone. The only trouble with doing a great magic trick is figuring out what to do when your friends want to see another. You shouldn’t repeat a trick for your audience because you lose the element of surprise and that makes it easier for them to figure out how it’s done. That’s why we’re teaching you a variety of methods. One of the cleanest and simplest coin vanishes uses just one coin and a piece of paper. Take small piece of paper about 2” by 3” and place a coin in the center. Hold the paper upwards so that the coin is out of view of your spectator and held by your left thumb against the center of the paper. Fold the paper back over the coin so that the paper is almost folded in half, but leave it off center by about a quarter of an inch. Fold the sides of the paper outwards and flatten them down with the quarter inside the packet. Next, turn the packet upward and fold down the last side outwards. While it seems like you’ve trapped the coin inside a sealed packet it can easily slip out the secret opening. Hold the packet firmly by the open side and let the spectator feel the coin inside. Press down on the paper so that the shape of the coin leaves an impression on the paper. This will make it appear that the coin is still inside even after you’ve snuck it out. Put the packet into your right hand with the secret opening down so the coin can slip out when you’re ready. Tap the coin on the table so it can be heard. 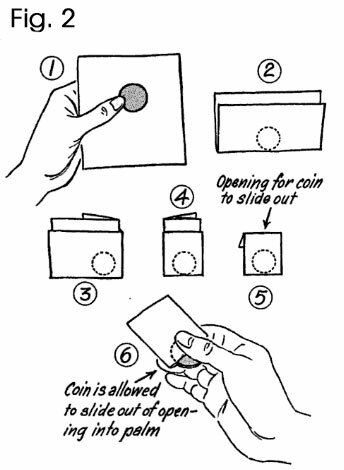 Transfer it back to your left hand and as you do let the coin slip out of the packet and into your fingers. Ask the spectator if he has a match or a lighter and put your right hand into your pocket to retrieve one, leaving the coin behind. Light the packet on fire and let drop it onto a plate. After the paper turns to ashes, the coin will seem to have vanished into the smoke. If burning the paper isn’t practical just tear it into tiny bits and toss them into the air like confetti. It’s magic! Be sure to take the time to practice these tricks in front of a mirror before you try them out in public. The author is a professional magician in Long Island. He performs magic shows in New York City and Long Island.